I'm really struggling with how to quilt my "triangles on parade" quilt. I've got some ideas that I want to bounce off of you but before I go into that I wanted to share yet another use I've come up with for Glad Press'n Seal. 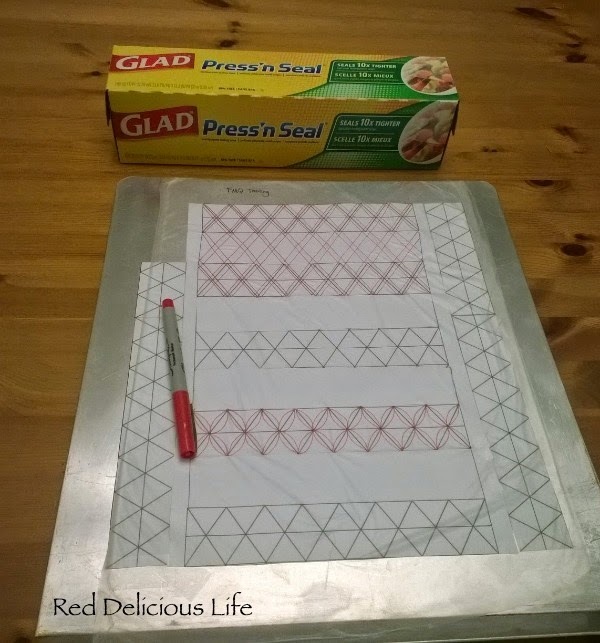 I've used it before to mark a quilt and sew right through it. This time I'm using it to audition some quilting options. I printed out a black and white rendering of my quilt and taped it to a cookie sheet. I then laid a piece of Press'n Seal over it. Now I can draw on it using a fine tip permanent marker to play around with how I might quilt it. (Yes, I admit it, I'm smiling ear-to-ear at my own cleverness). Before I added the white sashing, my intention was to straight line quilt along the triangles, highlighting the triangle pattern. I'm not sure if I still want to do that now. Will that still look okay with the white, especially if I go with my original thread choice of a light celery green? I'd essentially be quilting triangles onto the white. Might be interesting and I could fill in some of them to make them pop. I don't know. Of course, half way through making the lines in the drawing above, I realized that I made my white sashing double what it should be. Each of the triangle sections (2 rows of triangles) are 12 inches high and the white sashing is 6 inches high. In the drawing I made them both 12 inches. Oops. It still gives me an idea of how it will look. My other thought would be to quilt curves on the triangles. I like that it would give some softer lines to all the angles of the triangles but then I really don't know what to do in the 6 inch sections of white. If I go with this option, I would use the celery green in the triangle sections and probably white in the white sections. What do you think? Any brilliant ideas or suggestions? 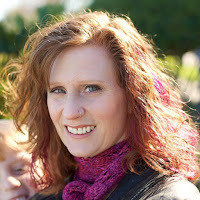 linking up to Tweety Loves Quilting's MOP (My Own Progress) Monday. I like the softer look the curves give the triangles; it makes an orange peel pattern which is very nice. You might then want to consider something different in the sashing; a curved meander? You could still use the curves in the white bits. 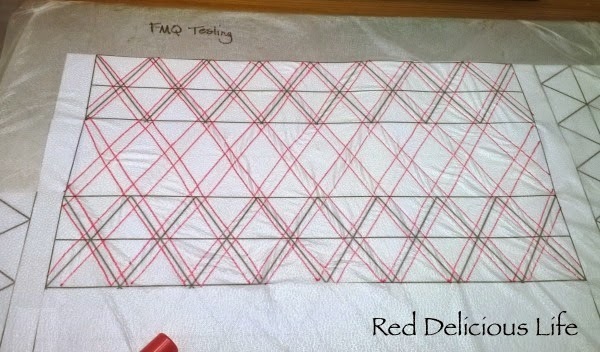 I like the idea of the quilting continuing the pattern even where the triangles are not. Will that work on the narrower side borders, though? You know how I said Y-seams don't frighten me? Choosing quilting patterns does frighten me. I would go for the curves on the triangles and continue them on in the white. I would also use the coloured thread on the white, but then I like to tie areas together in some way and am not so much a fan of very stark white in a quilt... And it would make it much easier to quilt in continuous lines rather than stopping and starting. I really like the curves. You could continue the curves through the white areas to add cohesion throughout the quilt. I like the idea of the celery going into the white, because I think that would give it some interest, but the curves would soften all the straight lines. I know not much help, I like both ideas. 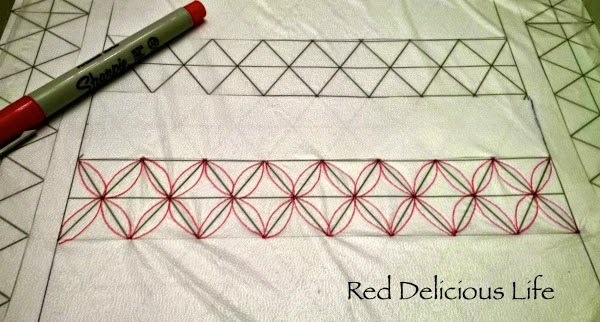 I like the curved option and I would go with your first plan of extending those triangles in the sashing - I'm into extending blocks these days :) And I would use the same colored thread on the white sashing. I think it would look amazing! I would pick the curve option... I think it complements the straight lines of the triangles! you are better with cling film than me I can never get it to do what I want it to. I like the idea of curves and yes celery green sounds right for the quilting. I know whatever you come up it will be a masterpiece. Here's one little voice for the straight lines! hahahaha! You can't lose, either way it will be a lovely finish. I agree with susan...either way youll have a great finish! Have to say I LOVE your ingenious idea to practice the design first! !